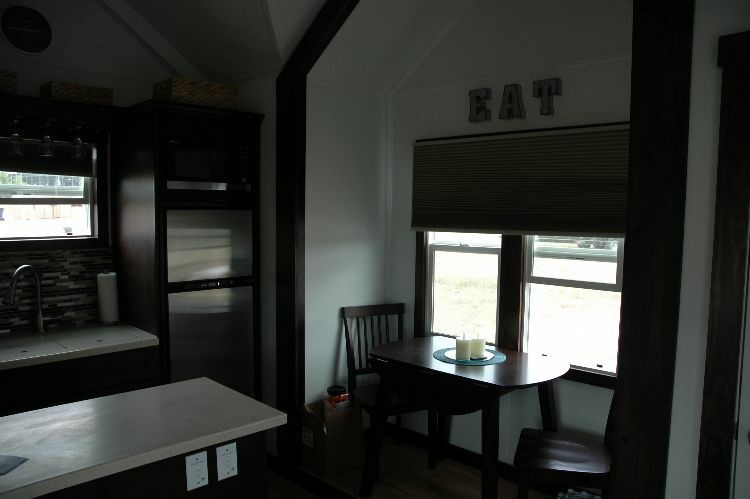 If you ever find yourself confused about what life in a tiny house might be like, this one built by Tiny Idahomes might be just the model you've been seeking. It even comes with instructions. Above the dining room nook is a sign on the wall that reads, "Eat." That's clear enough. On another wall is an inscription that reads, "Living simple." 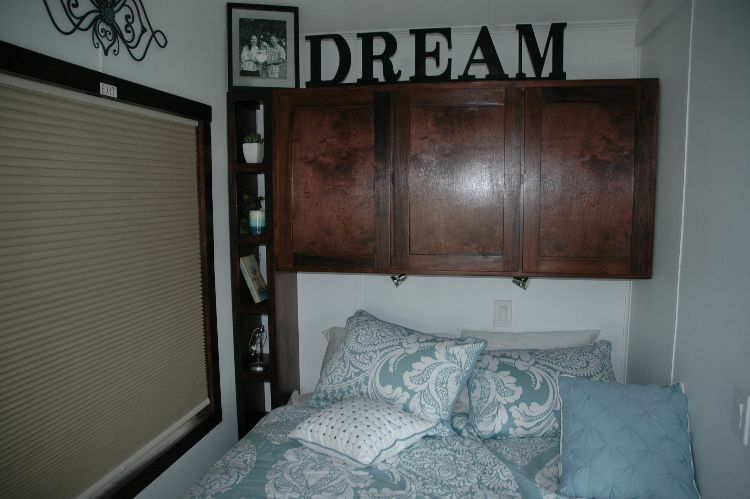 And above the bed is a sign that sums it all up in big, block lettering: "Dream." 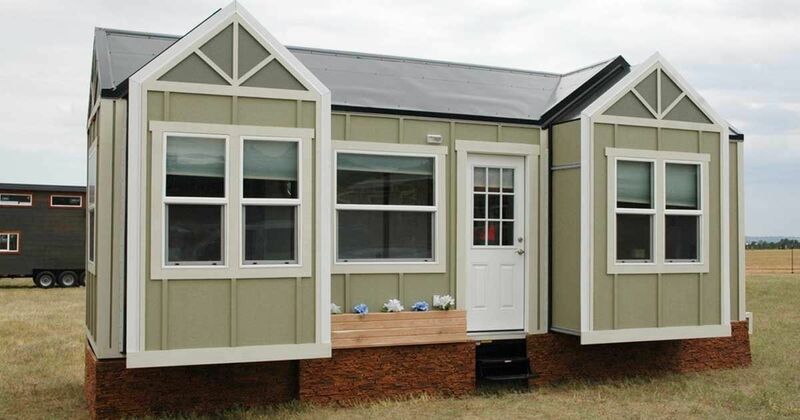 But this tiny house is deceivingly luxurious. The most amazing features are three pop-out A-frames that extend the size of the house and give it a convincingly residential look. 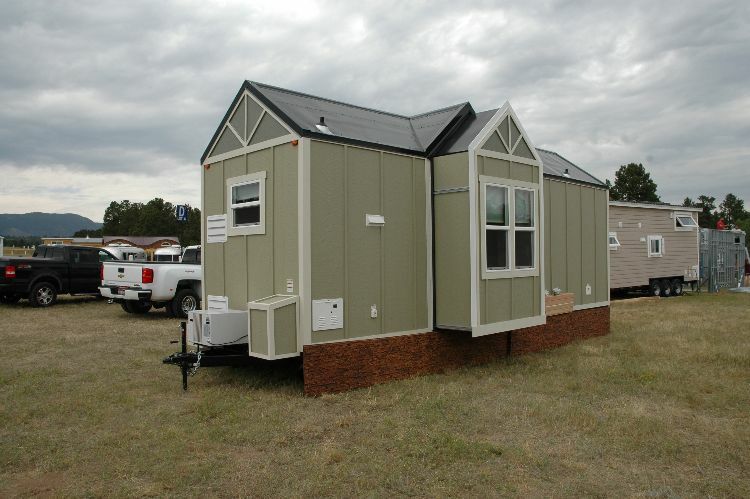 It is made of solid, two-by-four construction with plywood walls and ceilings and a metal roof. 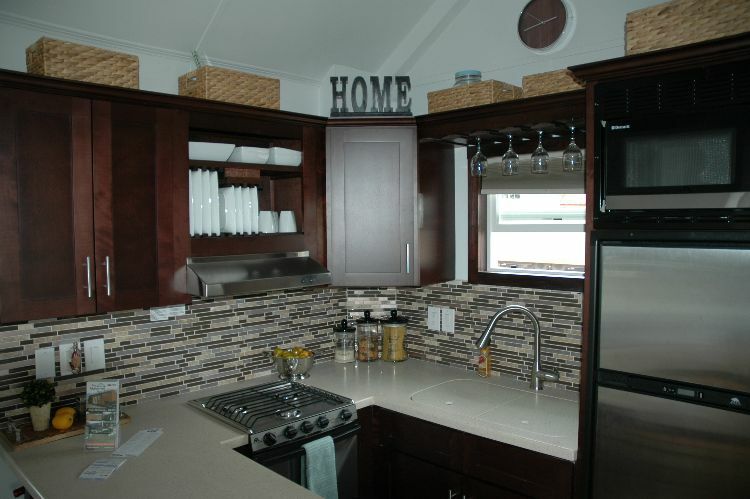 The kitchen is equipped with a Norcold RV 2-door refrigerator and an Atwood 22-inch gas range/oven with a range hood. 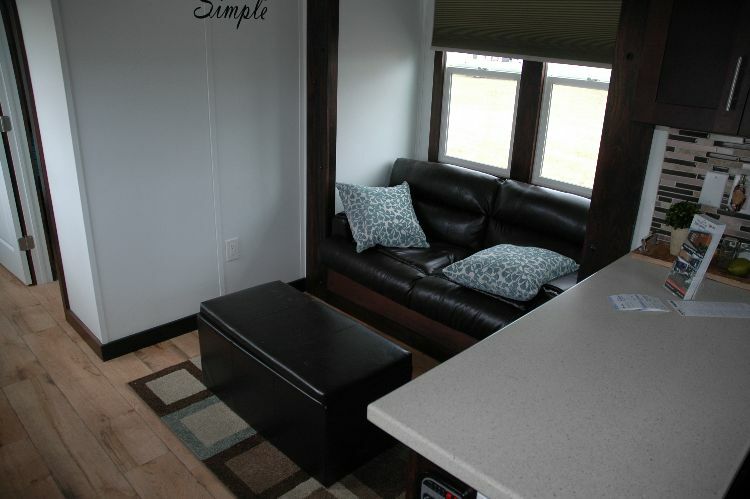 It has an on-demand water heater and a porcelain RV toilet and a shower. But that's enough for spoilers. Let's take a tour and see what might surprise us. Above is a view of the third pop-out A-frame. When the A-frames are pushed back in, the house is very mobile. It has logged more than 4,000 miles on the road, as it has traveled to tiny house shows around the country. However, it's leaving its professional road life behind and is on the market for a new owner. This is a fully functioning kitchen with a refrigerator, gas range with an oven and plenty of cabinets and counter space. 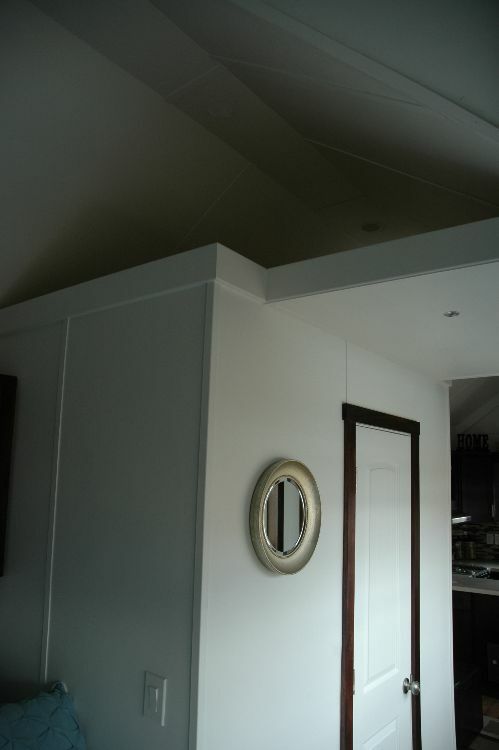 The dining nook is on the right in a pop-out section. This view shows you what it might be like to prepare a meal here. The sink includes a cover that increases the amount of counter space for meal preparation. You can see that this kitchen is well-equipped, but it is, essentially, a one-cook-at-a-time kitchen. Here's a better view of the dinning table, which is in one of the slide-out A-frames. This A-frame pop-out is the one in the middle of the house, which slides open toward the back side. It creates a nice living room. The counter on the right is the kitchen. 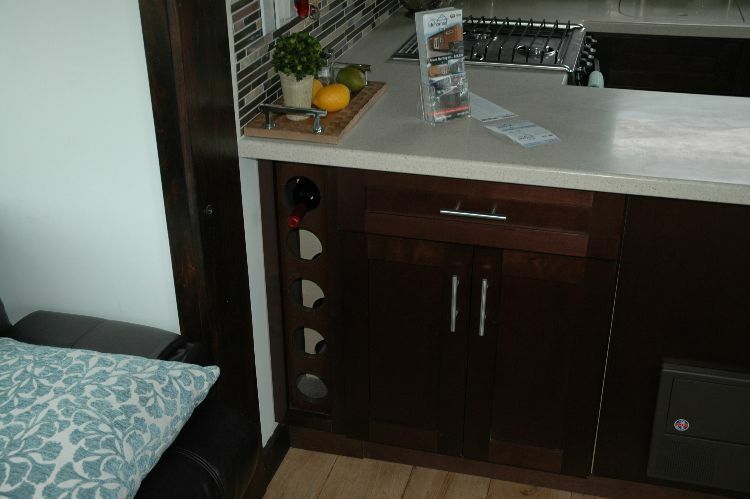 The back of this kitchen counter has built-in wine rack. 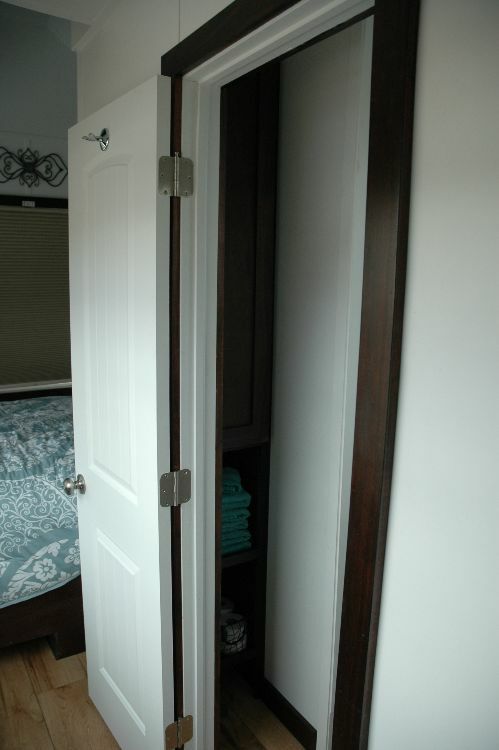 Here is one of the slimmest closets you will ever see. 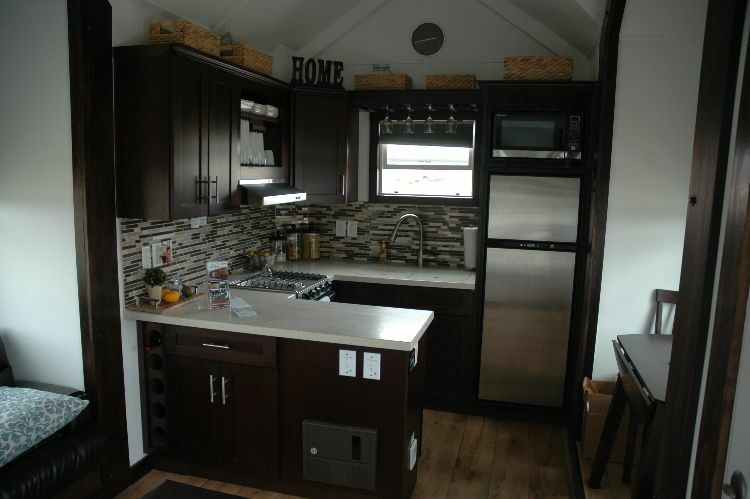 But tiny-home dwellers appreciate any amount of storage space. Here's a view down the hallway from the bedroom. The bed looks cozy, but the real treat here is the size of that bedroom window. 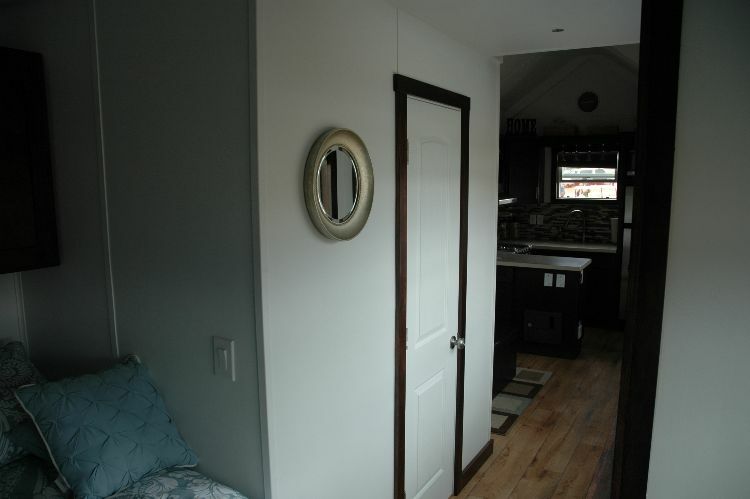 Since this tiny house has a full bedroom, rather than a sleeping loft, there is room for storage cabinets above the bed. The bathroom isn't big, but it's big enough to fit everything you need in a bathroom. 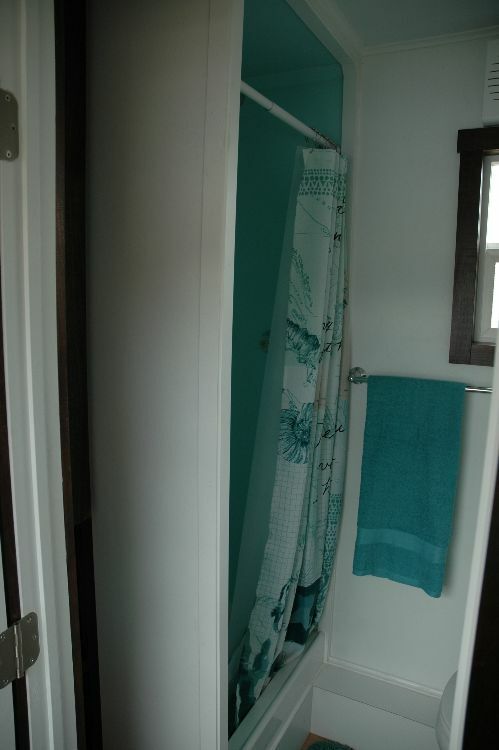 Some tiny homes have showers that are no more than a shower curtain that falls into an aluminum bucket. This is the real deal, with a towel rack to boot. The Corian shower also lights up with LED lighting. 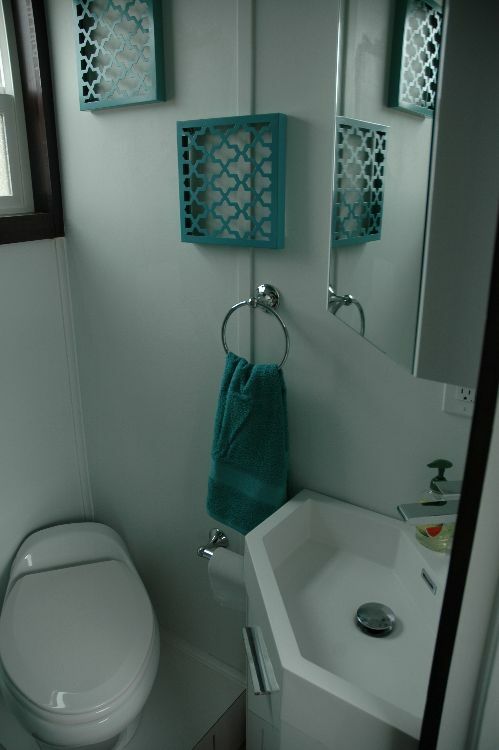 There are no lofts in this tiny home, but you'll find a good amount of storage space on a shelf above the bathroom.